So what's new in the world of bedroom decorating? Ideas vary from highly minimalist, square lines, and plenty of hidden storage, to romantic looks with the current color trend of rich yellows and berry colors, complete with canopy beds. The size of the room / style of the house. If you share the bedroom with anyone. Does it need to be multipurpose - e.g. is it also a home office, or studio. Whilst it's easy to create a look for everyone, convincing your other half of the qualities of floral yellows, and a romantic bed canopy may be a fruitless exercise, if they prefer a more masculine minimalist look, with clean lines. If your room is a multipurpose one with little space, then it's going to be difficult to embrace vintage style with a laptop amongst the decor. So think about these factors, before taking on one of the new bedroom decorating ideas in your home. Neutral colors - you don't have to stick to cream and beige though, grey is a hot color trend at the moment that would work well, as well as the winning black & white combination for accents. 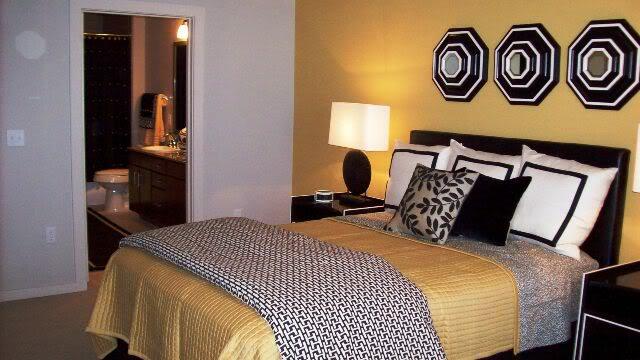 Texture plays a huge role in this bedroom style, to compensate for the lack of color. The use of natural materials such as leather, glass and wood are widely used. Try using a fake fur throw over the end of a bed. Mirrors, of any description add a different texture and feel to the room as well as adding more space to a smaller room. Can be used as tiles on door, mirrored wardrobe doors, or simple mirrors hung in threes (triptych), directly onto the wall, with no frame. 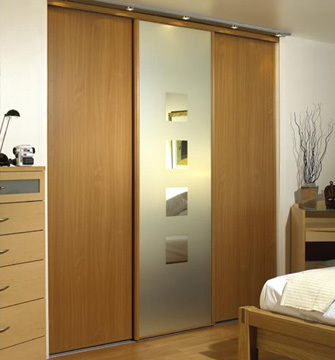 Clean lines - slidedoor wardrobes, hidden TVs, simple handles or no handles on drawers, epitomize this look. Flooring is simple, either a neutral colored carpet, or warm colored wood. Make it work for you - Create a feature wall using one of the latest large print wallpapers, or a striking color painted wall. Add some DIY wall art to add a splash of color. Romance is never dead, when you have so many options to create a romantic retreat in your bedroom. Canopy beds, are an instant way to create romance in a bedroom, from a modern four poster style with a tented canopy, to a more flowing sheer voile fabric draped at the head of the bed. The new over-sized floral print wallpapers work well in a romantic room, creating a sense of drama if you use the more dynamic and deep color combinations. 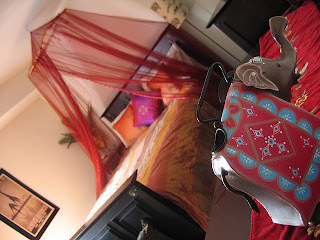 Most colors apart from bright primary colors, work in a romantic room. Deep purple berry shades and neutrals work especially well. Storage doesn't have to be hidden away, but wooden storage should be either stained dark, or painted cream or white. Make it work for you - use plain color on the walls rather than patterned wallpaper, and add features to the wall that mean something to you instead. Use roman shades instead of luxurious drapes to dial down the girlie-factor. The style should be relaxed and comfortable, rather than structured and streamlined - creating a peaceful but fashionable retreat is the goal. Lots of soft furnishings soften the edges of any furniture. Walls can be left plain in the current color trends of - grey, mushroom, linen, metallics, rich yellow, deep blue, blackberry, rich red. With accents of off-white and black. Pattern can be used as wallpaper, drapes, or bedclothes. Florals are big news right now, especially large flowing designs, in the colors of the season. Accent anything with black or grey, to add sophistication this season. Make it work for you - if you want to embrace the pattern trend but don't want to use florals, then opt for stripes which are also a current trend - try metallic horizontal printed stripes to create a larger feeling space. Add relaxed chairs if you have room. This might seem like an odd choice to be included in an article about new bedroom decorating trends, but the idea isn't as strange as it sounds. There is a definite lean towards the revival of more classic and historical looks, allowing us to combine different eras into one style idea for a modern decorated bedroom. Furniture can be mis-matched to create an eclectic look. 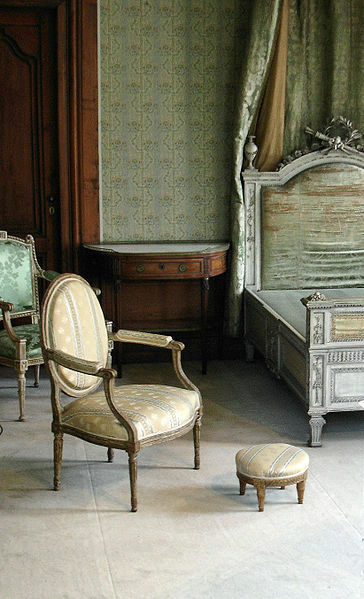 It should either be grand wooden chairs, or beds with lustrous fabric padding like an old-fashioned French boudoir. Or true painted furniture in the shabby chic style. Walls can be painted in vintage colors of powder blue, cream, dusky pink, or olive green, or use the modern scroll and swirl patterned wallpapers. An ornate mirror should figure somewhere in the room to add some sheen, and you could also add a simple chandelier for the same purpose. Doors, skirting boards, and coving can be stained with a dark oak wax. Drapes should be luxurious with fabric pooling onto the floor. Make it work for you - storage can be put out on display so use plain wooden boxes and paint them in a coordinating color. Be truly eclectic and employ some old world style, adding animal prints to jazz up the decor. If you like some of the ideas from one bedroom scheme, and some from another, then don't be afraid to combine the styles to suit you. Romantic styles can combine easily with the vintage style, to suit your tastes. 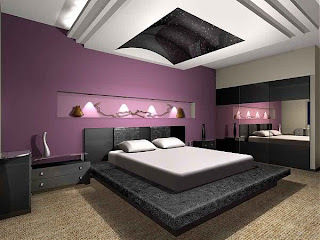 A romantic bedroom can also feature a modern style of canopy bed, and the use of more masculine colors, with the odd floral or sequined cushion thrown in for contrast. Hang items on the wall of any scheme that mean something to you to create more personal style - items such as guitars and surfboards add a striking touch to any of the new bedroom decorating ideas given here.